One of the (excellent/strong/trustworthy) voices in the world of Technology in Music Education is Katie Wardrobe, an Australian who is an expert in the field. Katie can teach just about any aspect of technology for music education at any level. Katie’s website is http://midnightmusic.com.au and one of the recent things Katie has done is to open her blog up to other educators to submit articles. One of my colleagues in my school district, Mallory Martin, recently had an article about “flipping the music classroom” published at Midnight Music. Please visit and support Midnight Music, and also visit Mallory’s website: https://mrsmartinsmusicroom.wordpress.com. As my ukulele launch in my middle school choir program draws near (either February 5th or 8th), I have been preparing for that launch. I am choosing to create my own method of teaching ukulele rather than to follow existing methods (e.g. Hal Leonard and Alfred). That said, I do have an eye on those methods as I plan. Assessment: I will test most skills in class, but realize that some students will be afraid to test in person. Therefore, we have a few ukuleles to check out overnight. Students can take them home and make a video of themselves (using the stock Camera app) playing the required testing material, and submit the video to me via Showbie. I also use Showbie to create rubrics–allowing me to assess each student–and Showbie's new grading feature allows me to quickly transfer grades from Showbie to our school's student information system. And finally, Amazon. I love music stores–but there are times that the added overhead of a music store cannot be tolerated in the cost of a program. 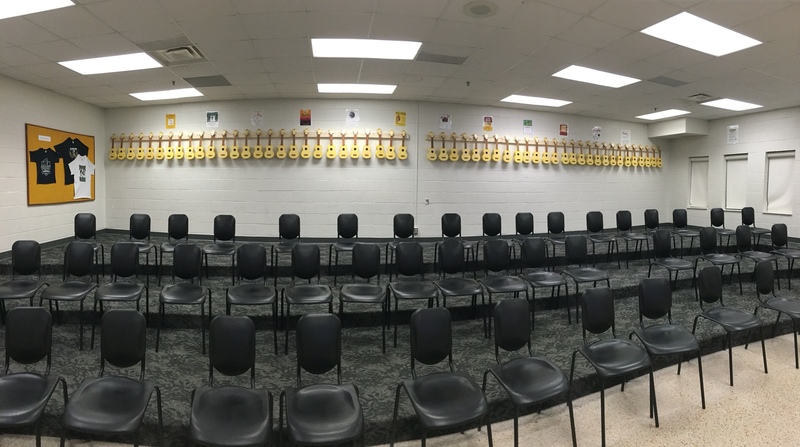 In our case, our entire set of 58 ukuleles (55 to be used in class, 3 to be sent home for practice/performance tests) were purchased from Amazon for under $2000–including setting up a ukulele hanging system with 2x4s and tool hooks. Unfortunately, if we had purchased these through a local vendor, the cost would have been well over $2000. Our ukuleles, Mahalo MK1s are throw-away models if anything serious happens (other than replacing strings). It would be a different situation if we had more expensive ukuleles that would warrant the need for repairs. 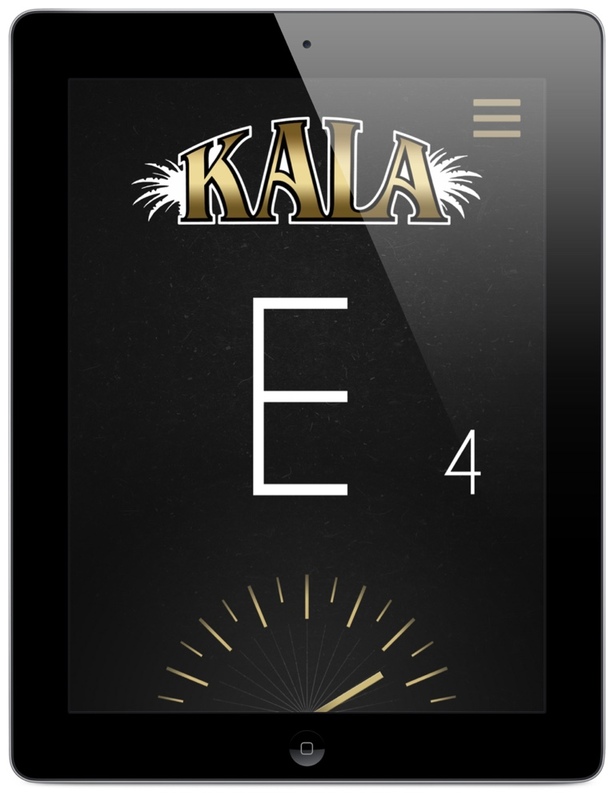 As a side note, the MK1s do eventually settle into their tuning–and I go through and tune each of the instruments once each day. The instruments I purchased in Novemeber are nearly always in tune. That is a relief–58 continually out-of-tune ukuleles would be a nightmare. 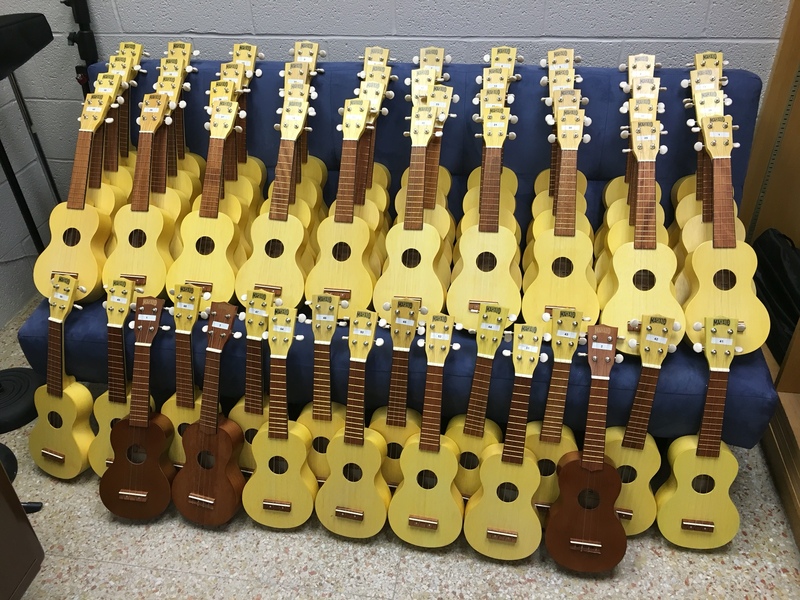 We actually bought 68 ukuleles, as we gave parents the ability to send some extra money to buy their students a ukulele to keep. 10 families bought a ukulele for home. In total, the booster program purchased 28 of the instruments, and parents donated money for 30 of them. Not a cent of this program is on the common tax payer. I have found out that Amazon's prices fluctuate wildly–the majority of our ukuleles were purchased around $25 each when they were backordered, but the instruments are now $37 each. This morning, I purchased 2 additional instruments from Amazon: A Caramel (a Chinese brand) Concert and a Caramel Tenor for $75, shipped. I want to give these inexpensive larger instruments a try. It will be nice to have a concert and tenor on hand at school–and also for students that might struggle with the small soprano (thinking about some of the giant 8th grade boys) to try. If the Caramel instruments are any good–I'll certainly blog about them. I also recently learned that D'Adarrio Ukuele strings are made by Aquilla (considered to be one of the best kinds of ukulele string), so it might be worth buying D'Addario for the savings over Aquilla. The shift to ukulele is shocking to me–I grew up in the era of Tiny Tim, where the ukulele was a joke to our culture. My training in music education didn't spend one second talking about ukuleles–at any level of my education (K-12, college, or grad school). It appears that the ukulele is as common in many other countries as recorder and guitar are in the United States (although guitar programs are relatively few in number compared to Band, Choir, and Orchestra at the secondary level). All I can say is this–I have fallen in love with the instrument, and I spend more than an hour each day playing and singing. It has resparked my love of music, and for that I am thankful. I now own two ukuleles (a Makala Concert, and a Kala Banjo Ukulele). There is a good chance that I will be adding a tenor ukulele (or two) to the stable in the near future. We also bought our boys a MK1 Mahalo, with the idea that they will leave my ukuleles alone (they are). When I tune my ukulele, my three year old runs up to me and asks me to tune his, too. As I mentioned at the top of this post, our integration with the ukulele is right around the corner. I am excited to bring this experience to our students, and to get them singing and reading music in a sneaky way. The possibilities are endless–we'll see what happens! My day is ending, and I thought I would write down a few thoughts about iOS before I went to bed. The update to iOS 9 came out at noon, and I downloaded it on my iPad (Air 2) and my iPhone (6) moments afterward. I had a meeting to attend, so I figured I could leave my devices in my office, and if they downloaded, great. If not, no worries. Well, they both downloaded just fine. iOS updates didn’t use to be that way. It used to be a hit or miss thing on the first day if you wanted to update, because Apple’s servers couldn’t handle the load. Not anymore. My wife was able to update her phone this evening without any issues, either. Over the years, lots of people have demanded multiple apps in a split screen. I have an Android device and a Windows device, and I just don’t use a tablet that way. The screen size is too limited. Perhaps it makes more sense on an iPad Pro, and I can see times, as a teacher, where I would want to show two apps. Most of the time though, I think I’ll simply use one screen. There are a few other changes that are readily apparent–the font is different and harder to read by my 42 year old eyes. On the iPad, you now have a row of four icons in the folders (I think it used to be three), and the biggest change is the keyboard. First of all, the keyboard shows whether you are typing in caps or lower case; and second, if you use two fingers on the keyboard, it acts like a trackpad. A two-finger tap on the keyboard will select things. This makes moving to the right spot in your document SO MUCH BETTER than the old magnifying glass. This has been a feature of a few apps for years…I wonder why Apple took so long to implement the idea. The only other thing to note is that there are 8,000,000 app updates today. And if you use a computer for mirroring (e.g. Reflector, Air Server, XMirage), these programs no longer work with iOS 9. Reflector 2 works, as does the Apple TV. But none of the other mirroring apps work. Don’t forget…you can also use a lighting cable on a Mac (Yosemite or newer) and show an iPad via QuickTime…but the joy in mirroring comes in wireless mirroring. There are blogs (see iMore, for example) that will go into much further depth on iOS 9. There are many more improvements to the OS, including with Siri. For me, if Siri simply works better with every release, that’s a win. Most of your apps will work with iOS 9, and other issues will be addressed in the days to come. This is really an update meant to fix problems and bring some new features without redesigning the OS. It has been tested like crazy by developers and public beta–it is probably safe for you to install, too. I’d do it for the keyboard tools alone. Today one author said that he now prefers typing on his iPad versus his MacBook for the trackpad feature alone. Last year was a huge year of change at MakeMusic. The company was acquired and went private (off the stock market). This was followed by some changes in the leadership team (two VPs were let go, one VP, Michael Good, was brought on the team) and other levels of management were also impacted (both program managers of Finale and SmartMusic were let go). In addition to the changes, SmartMusic (in particular) had a rough first half of the 2013-2014 school year with a number of technical issues. As with all things in life, a lot of good things happened, too. Finale 2014 was released with a number of new features, a lot of new code, and backwards compatible file formats; SmartMusic continuted to grow in functionality on the iPad, and now SmartMusic also shares backwards compatible files. Michael Good discussed many of these improvements on a recent blog post (link). Today brought news about another big change at MakeMusic. MakeMusic is coming under the umbrella of Peaksware, Inc. Peaksware was behind the acquisition last year, and MakeMusic will continue to exist as a brand of Peaksware. I had the chance to chat with Gear Fisher, the CEO of Peaskware, for a few moments and to ask some questions about the immediate future of MakeMusic. Ultimately, this change won’t likely impact the typical Finale or SmartMusic user very much. The biggest change is that the company will be moving from Minnesota to Colorado (plans are to do this in Quarter 1), and the company is assessing personnel right now. A number of employees will be asked to join the company in Colorado, and those employees will have to make a personal decision to move or not. After this past winter in Minnesota, I don’t know why anyone, given the chance to move, would stay here. I find myself to be sad that MakeMusic will be moving–it has always been wonderful to have MakeMusic (or its predecessor, Coda Music Technology) as a “local company.” At some level, it is a personal sadness, because I would have enjoyed working at MakeMusic as a local company (As part of a blended family and all that entails, we cannot move out of the area). It isn’t often that you find companies filled with good people that are passonate about the meeting point of technology and music education. Beyond that, Finale will continue to improve, SmartMusic will continue to improve, and the company should be better positioned to exist and compete in the future. This was the ideal time for such an announcement, as all of the turmoil from the acquisition last year has finally settled down and the products are stable. Jobs will be moving (or created) in another state (not outsourced to another country), and I hope that a majority of the development teams–including some leadership–will stay in place, albeit in another location. The end result of today’s announcment is that there won’t be much of a change for the end user, but there will be big changes ahead for all of the 130+ staff employed by MakeMusic. I wish all of the MakeMusic team the very best. For those that will be moving to Colorado, best wishes for the process of relocation and as you continue to develop and refine MakeMusic products. And to those who choose to stay in Minnesota, best wishes as you search for new positions. To all of you: your work (including those that have worked in the company in the past) has made a significant impact on music and music education. Thank you for your work! And best wishes to Mr. Fisher, as he takes on the role as CEO over MakeMusic through this position as CEO of Peaksware. One additional note that might be of interest to music educators: I had opportunity to ask Mr. Fisher about his own musical background, and he had been a saxophone player in his school days. He did, however, state that his current experience with SmartMusic comes from his own home, where his 11 year old daughter is learning the clarinet. She is using SmartMusic as part of that process. It is encouraging to know that the CEO of the company–if not using the software himself–is seeing the software used as it was meant to be used. That experience will offer him fantastic insight into the product for years to come. This post is NOT about technology in music education, but about some new technology in my life. I post this for anyone else considering this product. I had mentioned in a tweet that my major Christmas wishlist was fulfilled by my parents, who came up from their home near Milwaukee to celebrate Christmas with us after Christmas. In particular, I was given a Quirky Pivot Power Genius, a power strip that bends (thus “pivot”) while two outlets are wi-fi controlled (thus “genius”) and a Nest Protect. The Power Genius went on a reduced price sale in December, and its features not only allow away-from-home operation, but also the ability to set a timer. 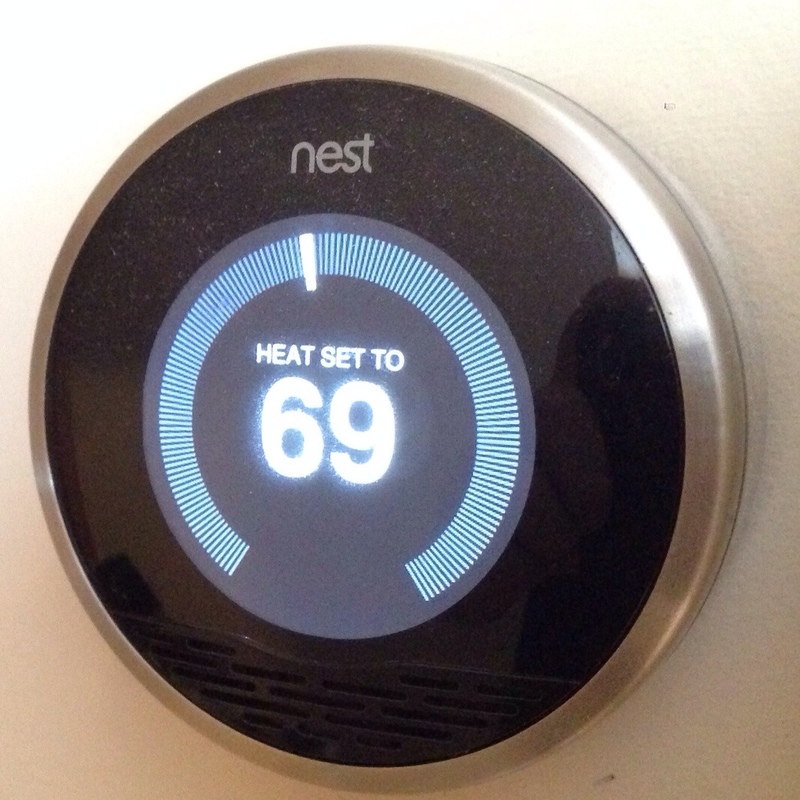 We have had a Nest Thermostat since nearly the first day of Nest products. We really like the Nest, and it is we believe the device has saved us its cost in energy savings. It not only allows you to set your temperature preferences, but it also learns your patterns in your house, creating optimized heat/air-conditioning settings for your life. We have a minimum temperature of 65 in our house, with a maximum of 80. Most of the year we live at 72 degrees, going down to 70 at night (although we do bump that up in the summer). We have been able to set the nest to “Away” when travelling, and it is nice to be able to check your house temperature at any time with the app that is available. If you own two houses, or a house and a cabin, you really should look into the Nest, as you can have multiple thermostats in one house or in multiple houses. It really has been a wonderful purchase. 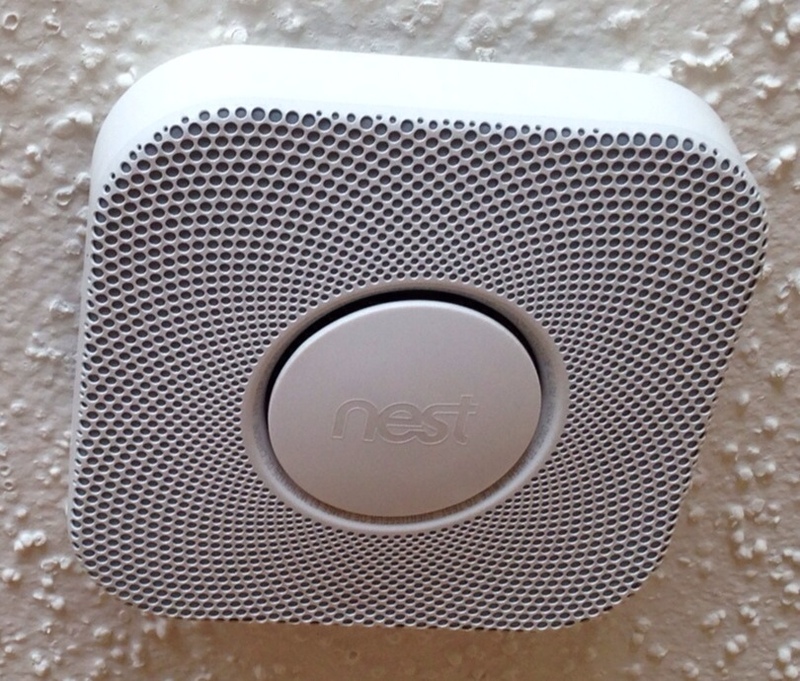 Last year, Nest began selling “Nest Protect,” a fire alarm and carbon dioxide detector. It links up with the entire Nest ecosystem, and offers a few other features. First, if it goes off, you can wave at it to turn it off. Second, if you have a wired alarm system (we do, as do most houses built since 2000), you never have to change batteries. Third, the system talks to you, and sends messages to connected devices, meaning other Nest Protects in your home AND your cell phone/tablet. So, if there is a fire in the kid's bedroom, Nest will announce, “Smoke is in the kid's bedroom” through every Nest Protect in your house, as well as to your cell phone. Finally, the Nest has a light, and turns on automatically to guide your way at night, or in the event of smoke in your house. The nest costs $129, and isn't your average $40 smoke/carbon dioxide detector. You can buy the wired version or the wireless version (which requires batteries). My mother was accidentally given the wireless model, and it turned out that we needed the wired version (to meet modern building codes), so she exchanged it, and I picked it up on my trip to the IMEC this weekend. Let's be honest…this isn't a cheap solution. To my count, we have seven smoke alarms in our house (built in 2004), and if we replaced every smoke alarm, we would be paying nearly $1000 for Nest Protects in all those locations in our house. The truth is that we only need–by code–four units, one within six feet of every bedroom (right now, every bedroom also has a smoke detector), so two upstairs, and one on each other level (first floor, and basement). But what you get is a device that is interconnected with your entire Nest system with 24 hour monitoring. If you would buy a service, that cost would be at least $25 per month with installation. Don't forget, all smoke alarms should be replaced every seven years (meaning that our smoke alarms are overdue), so potentially this is a $560 to $1000 expense ever seven years, so $6.00 to $11.90 a year depending on whether we purchase four or seven smoke alarms. That's still less than half the price of a monitoring service, and you would be spending $160 to $280 on a “stock” smoke/carbon dioxide detector every seven years. The only troubling aspect of Nest is that the company was purchase a couple of weeks ago by Google, which drastically wants to know everything about us so that it can sell information about us to the highest bidder (this is another reason to be cautious about Google in education). I'm not being mean–Google makes its money in targeted advertising based on the information it collects. The most anti-Google pundits are cautioning doom and gloom saying that Nest will be ripped apart and used in other Google products. To be fair, this has happened a lot to Google acquisitions. The most pro-Google pundits are saying that Nest will continue as a separate company, having a positive impact on Google which tends to be well engineered but not designed with style. Reality will probably end somewhere in the middle; I think Nest will continue with other products (such as taking over the slow-moving Lockitron wi-fi door lock) but I do think that Nest information will eventually make it into Google's servers. That's not okay with me, but they already have access to all my personal e-mail, not to mention all of my school material on GAFE. And if Nest can positively impact the style of Google services across the board, with the end user in mind, we all win. At any rate, I'm very happy with our Nest and I believe I will be happy with Nest Protect. If we ever have a fire or a carbon monoxide issue, it will be worth every cent that we spend. We continue to move towards this “internet of things,” basically moving our house to wi-fi connected elements as it makes sense to do so; our garage door is wi-fi enabled (this is a blessing…you can see if the door is open), our front door will be (if Lockitron ever manages to send out their product), and now our thermostat and our smoke/carbon monoxide alarms. Yesterday I had the opportunity to attend the AMLE 40th Annual Conference for Middle Level Education in Minneapolis, Minnesota. All of the middle school teachers in our district (four schools) went to the conference, as it is quite literally in our back yard this year. The next conference will be held in Tennessee next November. There were hundreds of sessions and hundreds of vendors, on a scale a bit smaller than TI:ME/TMEA. Not a single session was focused on music education, and only one vendor, Yamaha, was represented for music education. The thing that concerns me about the lack of music education vendors is that many middle school administrators who would never go to a music education conference were at the AMLE Conference, so there was a bit of a missed opportunity there. A lot of educational technology vendors were also lacking. My technology vendor highlight was to see the Raspberry PI in person, and I’ll be ordering one. I attended some technology sessions in lieu of any music education sessions, and in particular I was reminded that Common Sense Media has a ton of resources for schools going 1:1 and for parents whose children have their own devices. By far, however, the most powerful part of the day for me came when I had a chance to sit down and have coffee with two other middle school choral music teachers who also use technology: Sue Bujold and Kim Cory, both from Minnesota (Kim, for the record, also teaches at the high school level). Sue teaches at Heritage Middle School, which was the first 1:1 middle school program in our state, and although Kim isn’t at a 1:1, she uses technology as she teaches her students in the Red Wing school district. We had a great conversation about iPads, apps, and instructional ideas, and I probably learned more from them than they did from me. At the end of our conversation, we talked about Yamaha’s Music In Education, a general music curriculum based around keyboard instruction. Kim really likes her MIE tools, but I found myself questioning the value of group keyboard instruction in this day and age. I didn’t know much about MIE, but my goal as a music educator is to try to find ways to keep kids in music and to offer courses that appeal to their interests while still providing “traditional” music education (i.e. band, choir, and orchestra). I didn’t mean to disrespect Kim’s choice of tools, and I hope it wasn’t taken that way. So here are some additional thoughts on the matter. What I found myself saying was that I would rather offer guitar (or even ukelele) to students as a general music option, and to teach music through guitar (not just notes/chords), versus a keyboard method. So if questioning the usefulness Yamaha MIE isn’t enough, I ask this question as well: “Does a keyboard-based general music method meet the music needs of the ‘80%’ in 2013, or would we be better served going another way?” Or better yet, for the non-music major, are keyboard skills essential? Granted, I am not a high level keyboard player, so a full-blown pianist would have another opinion, as piano playing is their hobby and life. But just because I play tuba, and I like tuba, I don’t think for a minute that every student should play it. After our chat, I found myself wandering to the Yamaha MIE booth, and I asked all kinds of questions and listened to the entire presentation. I have not personally used the method, so my observations are limited by lack of experience. MIE is made up of a group of sixteen specially-outfitted keyboards. One keyboard becomes the master, and is linked to a computer. That master keyboard is then daisy-chained via MIDI to each of the other fifteen keyboards, which can be split into two sides (there is even a plastic cover that can go over the center keys of the keyboard), giving each student a two-octave keyboard. The master program provides content and accompaniments to each half keyboard, even allowing for assessments. The latest version of MIE also lets an iPad link to the computer, controlling many things remotely, so you can move around the room as students work. Students work off of a large spiral-bound workbook of songs that teach different concepts in music education, all based around the keyboard. The program currently costs $24,500 which included a three-day traning session for the music educator. The current system is MIE 3, and existing MIE 2 keyboards can be upgraded to MIE 3. If you are a MIE 1 school, you need to buy new equipment. The $24,500 also includes a MacBook Air and an iPad mini for the instructor to use in the MIE lab. New teachers to an existing lab can be trained for $1,800. I find myself to be skeptical of the keyboard itself, which does not even offer MIDI via USB (which has been around for years). At the price of each individual device, it is unfathomable for Yamaha–who makes the unbelievable AvantGrande digital piano–to be selling a piano with 1990s technology at 2013 prices. 1) Purchase 30 guitars at $200 each, plus $1000 of accessories (strings, string winders, etc.) and books. Attend the annual guitar education sessions in your area (look at guitaredunet.com). Remember: teaching guitar does not HAVE to be “just” notes, chords, and tabs. The challenge here is to break the “traditional” music education mindset where those of us who teach band, choir, and orchestra simply don’t want to teach guitar. 2) Purchase 30 iPads at $599 each, plus a $50 in apps for each device. Teach about music through GarageBand, or even piano skills with apps like Piano DustBuster. You might want to factor in cases, too. 3) Or, even further, when they are available, purchase the iPads and then add a keyboard like the Miselu C.24 that is coming soon (it’s an iPad case that is a keyboard). The price should be less than $200 each. These keyboards–with 24 keys, almost the same as a single side of the Yamaha MIE, could then be used with the iPads for apps like GarageBand..
4) Consider a set of Zivix JamStiks to be used with the iPads, allowing you to teach guitar with the JamStiks. Again, these are just thoughts of mine as I question a 100% keyboard-based general music curriculum. I’m not sure I would recommend the MIE approach in 2013. In my opinion–and that’s all it is–there are probably better options in 2013. If you have an existing Yamaha MIE lab, by all means, keep using it. But when MIE 4 comes out, and if you can’t upgrade…then maybe it is time to look elsewhere. NOTE: Sue Bujold also wrote about AMLE today, and in doing so, she reminded me that various middle school music programs were featured as entertainment throughout the day. So music did have a role in the conference–but not in sessions or in the vending area. Maybe that is the fault of middle school music teachers not proposing sessions (I will for 2014), but still, if you wanted to find things, you had to do so outside of our area of expertise, and try to make things fit into music. Sue makes an exceptional point that sometimes non-music teachers could learn a lot from music teachers, as we deal with situations that the average teacher does not. Sue deals with 500 students every two days (more than double my load), by herself. That makes an average class size of at least 50 students. Most classroom teachers wouldn’t know what to do with 50 students for a class, or how to deal with them every-other day. So…read Sue’s blog. She doesn’t post often, but when she does, it is worth reading–and I hope she posts more in the days to come.